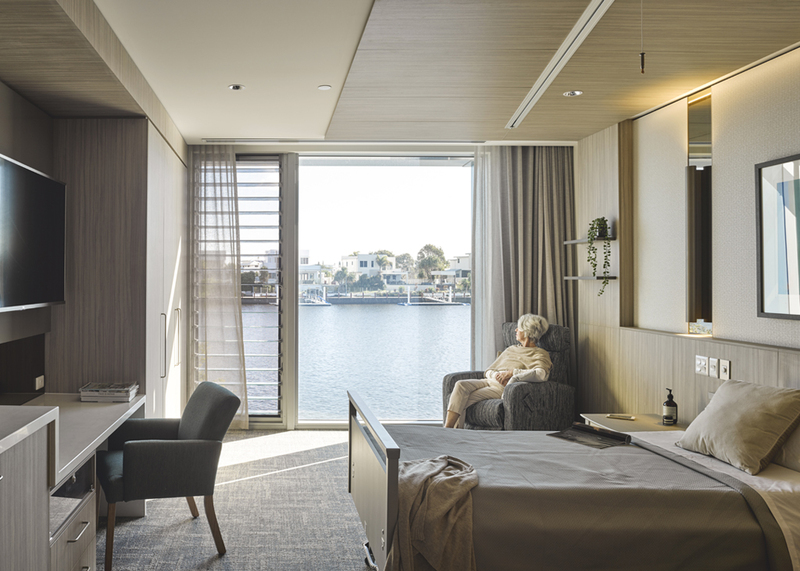 TriCare’s Kawana Waters development demonstrates design principles for a new generation of aged care. This building, the first in a two-stage development, will be home for 80 residents. The design goes beyond essential functional and operational criteria, creating a tranquil environment that engages the senses and emotions. The residents’ quality of life, comfort and care needs have guided the approach. 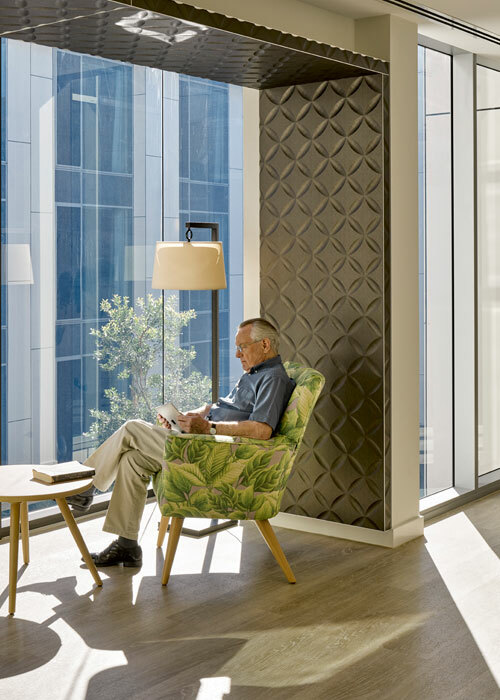 The design brings focus to experiential, social and atmospheric factors, recognising that these attributes can positively impact residents’ wellbeing. Features of the building include the light-filled watermall, varied private and social spaces, generous and carefully detailed suites, and layered opportunities to experience a sense of belonging and community. The building dramatically and unexpectedly capitalizes on its location to deliver engaging connections with nature; there are safe places to feel the sun or a breeze, especially important for residents with limited mobility. The watermall is glazed to the north, delivering healthy access to natural daylight and changing conditions of light throughout the day. This space is public in character and orientates visitors and residents; it extends across the site, from arrival to the riverside edge. A planted courtyard is central to the plan. Two wings of residents’ rooms flank this, giving most suites an engaging outlook either to water or the courtyard. Our interior designers worked closely with suppliers to deliver considered quality, tactility, comfort and high performance durability. 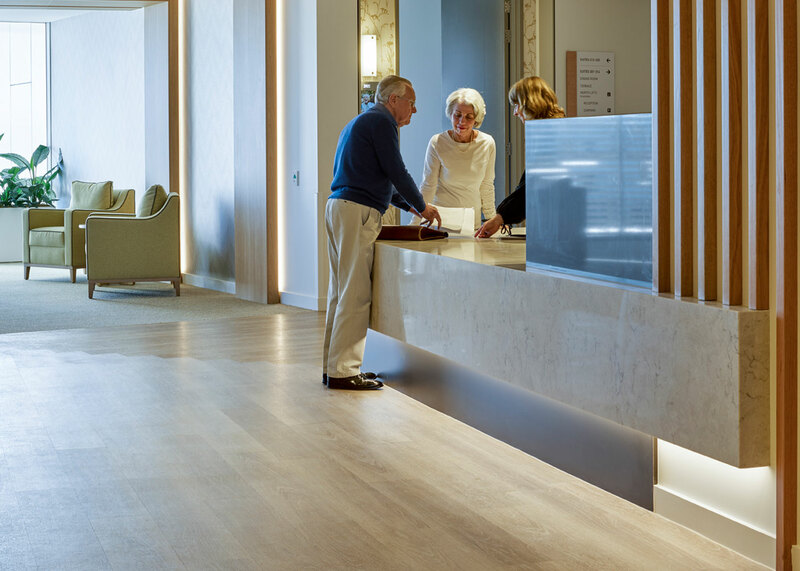 For high care residents with limited mobility, these spaces and their qualities are vital to wellbeing. Specific colour selections ensure legibility for residents with dementia.